Join us at Annenberg PetSpace in November for a four-week series of dog training classes. 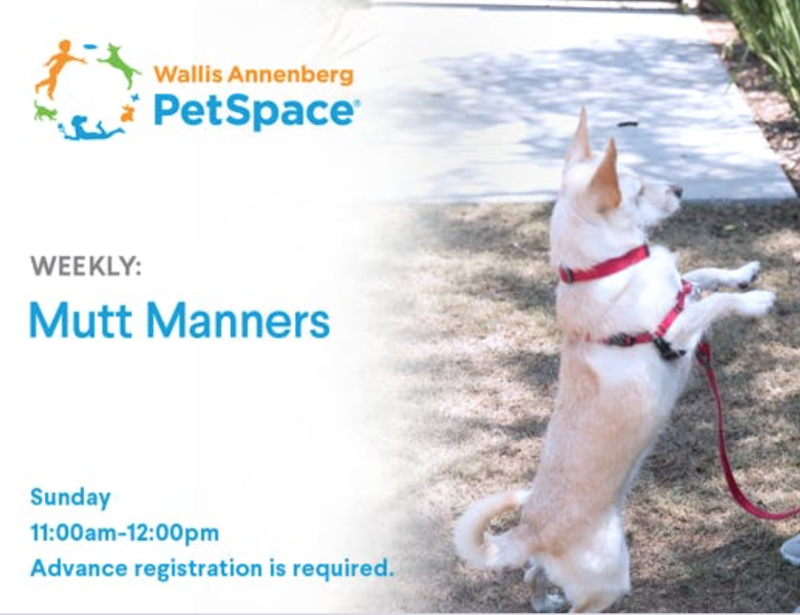 Wallis Annenberg PetSpace invites you and your dog to join us for our Obedience Dog Training Class. These four, one-hour classes are designed for dogs that are comfortable with new dogs and people and want to improve their manners. Our Certified Professional Dog Trainer, Katie McGuire, will help your four-legged friend learn a host of new tricks and behaviors, ranging from how to sit and leave-it to walking politely on a leash. Classes take place indoors or outdoors and will be limited to 10 dogs. Register now to save your spot! Participants' – both pet parents and their dogs – health and safety are our highest priority. This means that all dogs must be up to date on their vaccines. Additionally, please note that this class is designed for dogs who are comfortable with new dogs and people. If your dog is reactive or becomes overexcited around new dogs and people, we suggest you register for a class that can specifically help your pet become calmer around other dogs and environments before joining this session. • Please do not feed your dog six hours prior to class; a hungry dog is a motivated learner! • Please bring plenty of your dog’s favorite treats!